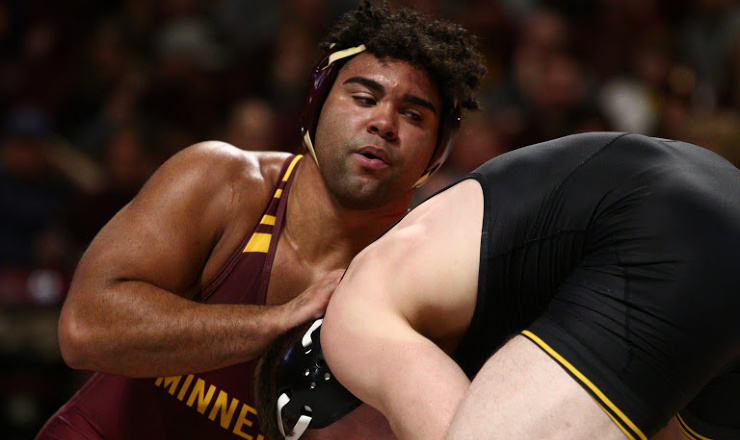 MINNEAPOLIS — The fourth-ranked University of Iowa wrestling team defended the Governor’s Border Belt on Sunday at Minnesota, defeating the eighth-ranked Gophers, 24-10, at a sold out Maturi Pavilion. Iowa won seven-of-10 matches, held a 17-8 edge on takedowns, and defeated three top 10 wrestlers to extend its winning streak over Minnesota to five. The 5,238 in attendance saw Iowa win four of five matches prior to intermission. Fifth-ranked Kaleb Young led things off with a 7-1 win at 157. The match was tied 1-1 before Young threw No. 9 Steve Bleise to his back with 10 seconds left in the third. Marinelli extended Iowa’s lead to 9-0, registering his fifth pin of the season. He led 8-1 before securing a fall in 5:55. Mitch Bowman nearly kept Iowa perfect through three bouts, but he ran out of time against No. 11 Devin Skatzka at 174. Trailing 7-1, Bowman scored a reversal and three takedowns in the final two-plus minutes, and was in on a shot when time expired on an 11-9 defeat. Cash Wilcke and Jacob Warner won by decision at 184 and 197, respectively, giving Iowa a 15-3 lead at the break. Minnesota cut the lead to 15-7 when No. 2 Gable Steveson defeated Connor Corbin, 12-3, at 285. Iowa responded with consecutive top 10 wins from Spencer Lee and Austin DeSanto at 125 and 133, respectively. Lee blanked No. 6 Sean Russell, 4-0, and DeSanto finished on top of No. 6 Ethan Lizak, 6-1, at 133. 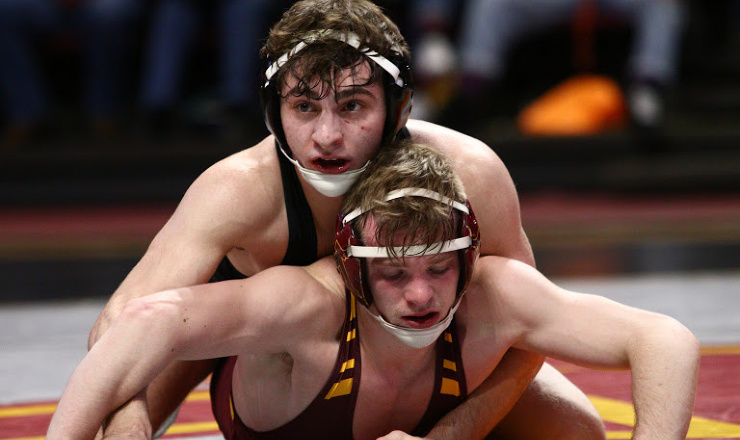 The Gophers got a win at 141, where No. 6 Mitch McKee won 5-3 against No. 15 Max Murin, but Iowa finished the dual back on top at 149. Twelfth-ranked Pat Lugo used two takedowns and two sets of back points to win by major decision, 14-0, against No. 20 Tommy Thorn. The Hawkeyes host No. 24 Rutgers on Friday at 8 p.m. (CT) at Carver-Hawkeye Arena. Tickets are available at the UI Athletics Ticket Office at Carver-Hawkeye Arena, over the phone at 800-IA-HAWKS, and online at hawkeyesports.com/tickets. Iowa has won five straight in the series and owns a 13-5 advantage battling for the Governor’s Border Belt. Iowa has won three straight at Minnesota. Kaleb Young defeated the first top 10 opponent of his career. Marinelli recorded his fifth fall of the season, matching his total from last year. He improved to 12-0. Jacob Warner won his Big Ten debut. Spencer Lee won for the 11th time in 14 career matches against top 10 opponents. Austin DeSanto earned his first win over a top 10 opponent and improved to 3-1 against ranked opponents. 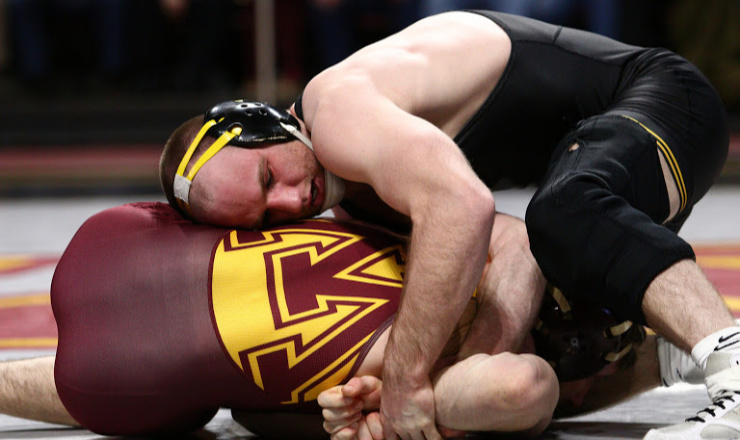 Iowa head coach Tom Brands improved to 13-5 against the Gophers. *Iowa deducted one team point for unsportsmanlike conduct.